Kitt's World: Fluttering by to say Hi. Working on keeping up with my challenges. For today's challenge over at Give a crafter a cookie. 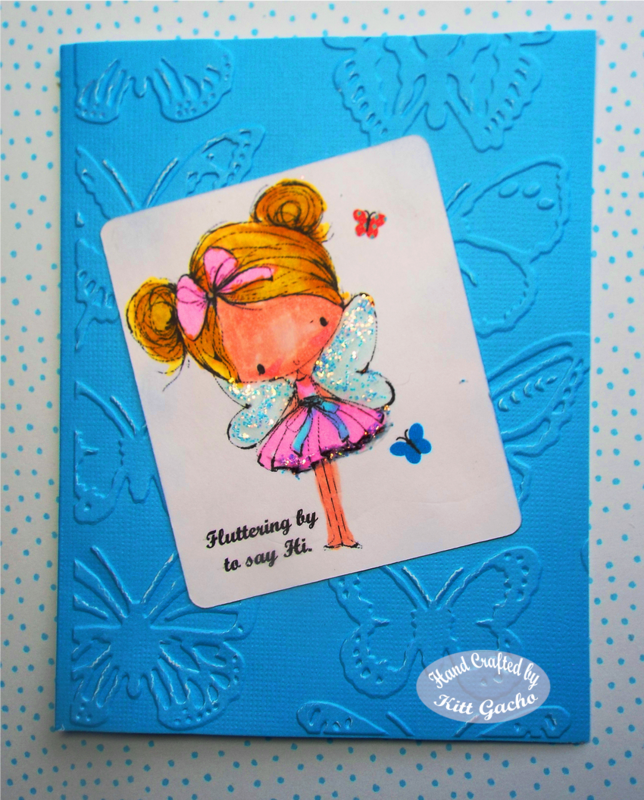 I used my new We R Memories butterfly embossing folder. I have both the Big Shot and the Cuttlebug. I couldn't get the folder to work right with my Cuttlebug. It is a large embossing folder. The Big Shot did a good job and it was a bit tight with folded cardstock. It makes a crisp line and as you may be able to see some white on the blue butterflies on the background. The image today is from our sponsor All Dressed Up. I used both my Spectrum Noir markers and Chameleon markers. I also used some new Ice Stickles by Ranger for the wings and skirt bottom for some bling. Thanks for stopping by today and leaving your comments. I love hearing from you. If you have not already seen my videos for the wedding favor boxes, you can find them Here. Please subscribe to my channel I will be making more video's through the year. You can also follow me here for the next 3D wedding project I have on my to do list. My friend is getting married next month so I have to get moving. Again, thanks for your comments, they are my inspiration to continue on this creative journey. Have a happy crafty day.